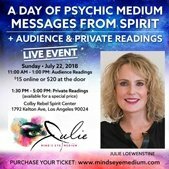 Join professional Ohio Psychic Medium Julie Loewenstine for a day of Psychic Medium Messages from Spirit. Witness Julie connecting with friends, family and loved ones who have crossed over, delivering messages that bring clarity, hope, healing and love. There is a special online price of only $15. Julie has been a professional medium for over 30 years. Julie will also offer private afternoon sessions.